I was lucky enough to be able to attend The Assembly, hosted by Destimetrics, in Denver, Colorado on January 31, 2014. This emerging conference focuses on the data and trends that effect resorts and vacation rental owners who are in the snow and mountain market. There has been double digit growth in the number of people using vacation rental homes… about 12% of vacationers choose vacation rentals. “To be part of destination tourism you need to be able to put your homes in front of people,” stated Bellm. Further, Bellm pointed out that there is a disconnect between the number of people searching for their vacation homes online and the ability to book their homes online. 67% of us are online dreaming, planning and researching our vacations, but only 10 to 15% of vacation homes have BOOK NOW on their website. Vacation homes that can easily be secured with one click are far more competitive in their market than those that do not offer this capability. “We see this category going mainstream in the next three years and being presented alongside hotels on online outlets.” Added Bellm. This means that the vacation rental market should start considering the huge difference that Priceline, Expedia and other travel portals have made with hotel visibility and bookings. This suggests that there is a huge opportunity for the professional property management company. HomeAway’s intention is to create a seamless experience in creating full service destination tourism by supporting the role of the professional property manager. With the median vacation home owners living 375 miles away, these owners need to turn to professionals to maintain their homes. By focusing on the properties special amenities (movie rooms, cook stocked kitchens, etc) and upsell experiences (spa services, eco tours, etc.) the professional property management company is far more likely to appeal to the family segment, the primary renter of vacation homes. HomeAway’s strategic plan is to feature these aspects in their presentation of these properties. Claiborne: Would you elaborate more on the relationship between HomeAway and the professional property company? Previously, this relationship has been marked by suspicion from property management companies. This seems to have waned. Why should this relationship be valued favorably on both sides? Brent: Our mission at HomeAway is to offer travelers the world’s best selection of vacation home rentals. That can only be accomplished in full partnership with property managers, because property managers represent roughly 40% of the market and offer services often not found at rent-by-owner properties. It’s true that many of our sites began as exclusively rent-by-owner listing services. Since acquiring them, we have opened them up to professionals and endeavored to create a fair and level playing field. We want to be the industry’s best marketing channel for owners and professional managers, and we’ve invested heavily to accomplish that while keeping our subscription-based pricing far below the benchmarks in other internet categories. Today, property managers are approaching a share on our sites commensurate with their total market share. Claiborne: Tell me specifically about what you are offering to the professional property manager as compared to a homeowner’s listing themselves on VRBO—is it better ranking or a different commission structure? Claiborne: What is HomeAway doing to strategically position yourselves to have vacation rentals to “act” more like hoteliers? Brent: We are focusing heavily on recognizing and rewarding our suppliers with the highest quality of listings and service. Within our subscription tiers, all properties are ranked based on criteria that include 1) calendar accuracy, 2) structured rates, 3) integrated payments capability, 4) reviews, and 5) photos. In the future, we plan to add criteria like inquiry responsiveness and booking conversion. The goal is to raise the standard of professionalism of the listings and service delivered through our site to equal or exceed that on hotel sites. 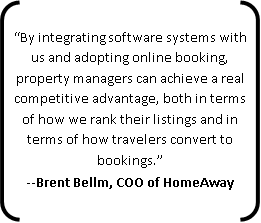 By integrating software systems with us and adopting online booking, property managers can achieve a real competitive advantage, both in terms of how we rank their listings and in terms of how travelers convert to bookings. Barefoot Technologies is a provider of vacation rental management software. We offer a technology platform that can be leveraged to help vacation rental companies grow their business, effectively compete in competitive markets and gain efficiencies. Barefoot has an out of the box integration with HomeAway. For more information, please contact Claiborne at claiborne@barefoot.com or call (252) 489-8238. For more information on HomeAway’s offerings, please visit their blog. Additional information about HomeAway’s online booking can be found in this blog.